Zuma is one of my favorite games of Fantasy Games series. 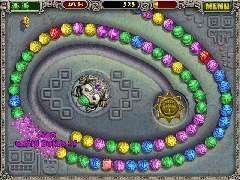 In the game a lot of balls of different colors will enter the screen continuous, and the balls onscreen are rolling by a fixed track in a queue. You can control the stone frog located at the center of screen to fire balls. The balls fired can be inserted into the rolling balls queue. When there is a group of 3 or more balls of the same color touching, they explode! You should eliminate all the balls before they reach the skull which lies on the end of the track. Let’s consider a simplified game mode. There is a queue of balls of different colors given. At each time you can fire a ball of arbitrary color into the queue at arbitrary position (either between two balls or at one end of the queue). Arbitrary means that you can choose the color and the position on your behalf. When there is a group of M or more balls of the same color touching, they explode. Explosion causes the balls on either side to slide together, perhaps chain-reacting into another explosion. You can only fire a ball of a certain color to a position where there is at least one ball of the same color touching. That is, after you fire the ball into the queue, there should be at least one ball of the same color touching the ball you fired. There may be some groups of M or more balls of the same color touching at the initial situation. These balls will explode just when another ball (not belonging to the group but has the same color) or another group of balls of the same color touches them. What is number of firings do you need at least to finish the game? Input contains multiple test cases. Each test case starts with an integer M (2 ≤ M ≤ 20) in one line. Following is one line of nonempty capital letters (A to Z). Each character specifies one ball of the color represented by the letter. The length of each line is no more than 200. There is one line for each test case, which is the number of firings you need at least to finish the game.